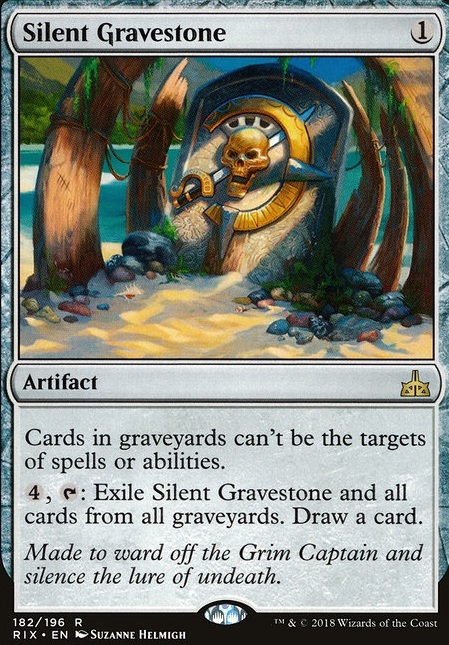 4, T: Exile Silent Gravestone and all cards from all graveyards. Draw a card. anything that 'stores a draw' seems like a good inclusion. 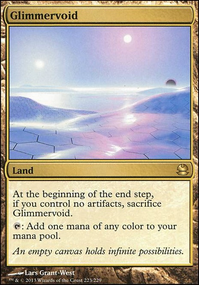 The Mind Stone and Commander's Sphere life sounds gud, but maybe even Chromatic Sphere and Chromatic Star might be worth your time to get your hand artificially empty quickly, and be able to sippy cup your cards back to hand at your leisure. 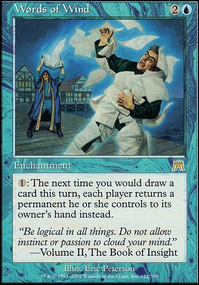 Those might be extreme examples, but certainly anything with utility like Cranial Archive or Relic of Progenitus seems aces. Hedron Archive , Magnifying Glass , Pyrite Spellbomb , Scrabbling Claws , Silent Gravestone are a few other reasonable effects in that style. Scenarios, where it could have been way more useful than my enchantment, is plentiful as far as I can recall! also, the only way to stop them with Aura Shards would be creatures with flash which also has very low odds to pull of anyway and we already have a fair bit of hate towards artifacts so it could actually act as a backup you can keep up if you have a Null Rod out and people are looking for an end step removal to try and go for a win on their turn regardless of how Staxy your board is with Artifact combos mentioned in the previous post. So, initially I looked passed this brew, but after a few moments, I realised you might be onto something. Maybe converting this deck into a Taxes style deck. Adding a couple of artifacts like Silent Gravestone Treasure Map Flip with Karn, Scion of Urza alongside Settle the Wreckage for added removal maybe Kaya can be a win con. Warlock1258 Before I get into an analysis of Lazav's placement, I would like to rebuttal you and ask what your dream sequence is to not only turn 3 somebody, but to do so consistently. Yes, turn 3 wins are in fact possible, but to turn 3 consistently and reliably is an entirely different question. 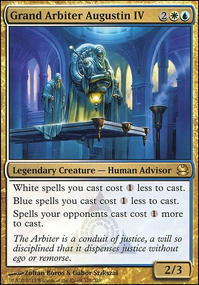 Lazav is in great tutor and draw colors, but his combo packages require a lot of set up and pieces to pull off, and if any one of those pieces are interrupted by getting exiled for example, you have to move on to another pile most of the time. My list is nowhere near being considered an optimal cEDH list, because I never intended it to play in a cEDH environment. However, I can confidently say that my game plan isn't far off from that of a fully optimized list, and what little improvements I would make if I were to optimize the list would not make the list noticeably more consistent. Tier 3 is appropriate in my book, I wanted him to be placed in tier 2 when he came out, but he gets stopped dead in his tracks by Rest in Peace, Silent Gravestone, Cursed Totem, and many others. Again, this is a short answer, but keep in mind that I have piloted the deck for many months now, and as much as I'd love to see him move up, I realistically don't see it as comparable to other tier 2 and above decks. It is very simply, the glassiest glass cannon around. Buried Alive decks are a dying breed I'm afraid due to higher relevance of graveyard hate in the meta, and backups to a failed Necrotic Ooze combo with another package consisting of Invisible Stalker/Vector Asp/Phyrexian Dreadnought are a little too mana intensive and janky for competitive play because that sort of backup requires multiple combat phases which translates to multiple turns to kill the table which is not ideal by any means. I hope that clarifies some things for you, feel free to ask me if some things still aren't clear to you. I would love to provide a more in depth explanation for why I feel from experience that Lazav isn't quite tier 2, but I hope what I have shared here is enough of a concise answer to your question. Tier 3 is still good and viable against competitive decks, so don't let that confuse you. 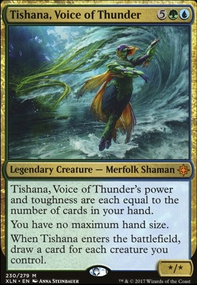 It's just that his combo packages isn't quite as condensed or as direct as other combo-centric decks in higher tiers, and are often highly interruptible as a result. You might like Grafdigger's Cage, Nihil Spellbomb, Relic of Progenitus, or Silent Gravestone more than Rest in Peace for a sideboard graveyard hate. 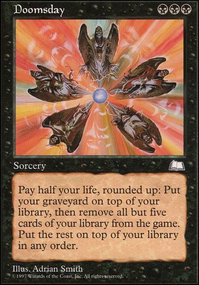 If a static graveyard exiling effect is on the battlefield and for some reason Emrakul dies or gets milled or discarded, it would get exiled with RIP instead of going to the graveyard so you would not be able to shuffle it into your library to recur it. Scavenger Grounds is also good to have graveyard hate on a land. Themastertransmuter on You thought you could combo? Think again thot! Profet93: You bring up a good point actually. 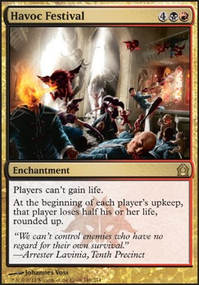 The reason I do not run Helm of Obedience combo is because, it does not break parity with our lock out cards. Most of the deck is able to operate around our lock outs. 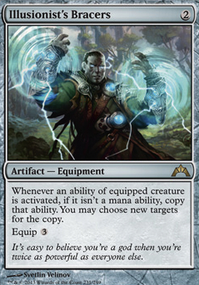 We run cards like Null Rod and Stony Silence and if they are out that work make the combo sort of hard to use around those cards. 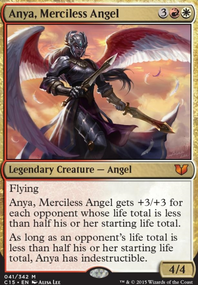 So, I ended up dropping it from the win con list. Also, Sol Ring is not on the list either because we do not really need it since we run the better version of it which is Mana Crypt and also our pesky lock out cards have us trying to not rely to much on mana rocks. Rest in Peace is a great card, I actually had it in the list prior to some of the updates. The main concern with it was that it seemed to hurt me more often then it hurt others. I will definitely bring it back in or using something else like Silent Gravestone or Ashes of the Abhorrent. That way my deck can work through it and not worry to much about losing cards to exile. The reason for this is I am thinking of adding my Timetwister in this deck because it works well with our Eye of the Storm plays. While also giving us another wheel to refill out hand and refresh our deck with old cards. I am keeping this sort of under 2,000 dollars (own personal goal).